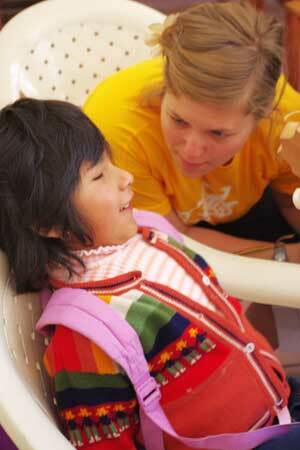 NIU alumna Molly Clesen teaches a song to a 4-year-old Bolivian child who is visually impaired. On Molly Clesen’s last day of teaching, one of her students asked her for a token of remembrance. They had formed a special bond over the summer, and Clesen was touched that the child had asked. She found a bracelet with her name on it and described what it looked like to the young girl, who was visually impaired. “Now I can’t forget you!” the child exclaimed affectionately as she graciously accepted the gift. Clesen, an NIU College of Education alumna, spent most of summer 2011 teaching in Bolivia. She earned her master’s degree in special education with a specialization in orientation and mobility and has been teaching students with visual impairments in Illinois for the past five years. Because of her desire to help underserved populations and her Spanish proficiency, Clesen chose to volunteer and work for the non-profit company, Sustainable Bolivia. Bolivia is one of the poorest countries in South America, and the majority of its people have little access to health care and education. Sustainable Bolivia, located in the large city of Cochabamba, pairs international students and professionals with volunteer positions in local organizations. Clesen was assigned to the Manuela E. Gandarillas Rehabilitation Center for children, adolescents and adults with visual impairments. The center’s mission is to provide these students with the educational and life skills they need to enter mainstream schools and live independently. The majority of Clesen’s time at the center was spent sharing curriculum ideas with the permanent staff. The center was extremely interested in learning about and incorporating U.S. teaching methods. She also worked one-on-one with the students, helping them with homework and extracurricular activities such as music. Clesen’s overall experience was “indescribable,” teaching her that she truly loves what she does. Graduate study at NIU helped prepare her for her work in Bolivia. Through a special government grant made possible by the efforts of faculty members Gaylen Kapperman and Jodi Sticken, the Department of Special and Early Education offers an intensive summer-only program specifically designed for teachers of the visually impaired.